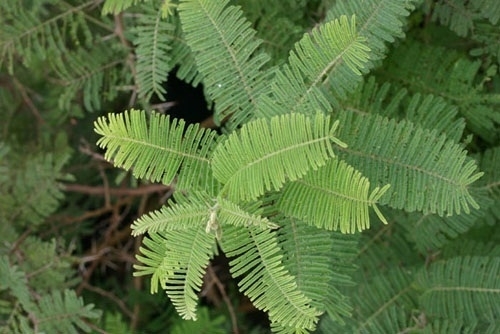 Acacia rehmanniana(Fabaceae), Silky Thorn (e), Sydoring (a), Musivhisha (v) Hardy, drought resistant, semi-deciduous Acacia with small, attractive grey-green, velvety leaves. The beautiful red bark on the young stems glows in the sunlight while the mature bark has dark brown rough strips with a red background. The white puffball flowers have a silvery sheen, and are grouped at the end of branches and appear in late summer. These are followed by clusters of lovely beige, woody pods that persist on the tree. It matures into a lovely flat-topped tree that can be used instead of Acacia sieberiana (Paper Bark Thorn) in smaller gardens. This beautiful medium sized Acacia attracts a host of wildlife and makes a wonderful garden plant. Size 6 to 10m. Sowing : The seeds need hot water treatment before they will germinate. Simply pour hot water over them and allow to cool. You will see if this has worked as the seeds will begin to swell as they absorb water. Do not leave them in the water for longer than 24 hours or they will start to deteriorate. Locality : Pretoria. Date of harvest : Sept 2018.